Another motorcycle from the Transformers The Last Knight movie is the Piaggio Vespa. Yes, I’m calling it a motorcycle although technically it is a scooter. It does after all have an engine and two wheels. The movie you can catch it in is the 2017 Transformers : The Last Knight film. The Vespa stars as an Autobot transformer called Sqweeks. 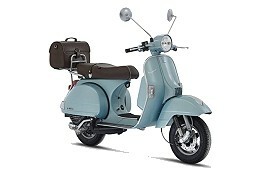 The actual Vespa model Sqweeks is based on is probably the PX125 or PX150 due to the round rear view mirrors. However due to various design features and that he has two head lights as eyes, a bicycle style seat as a back covering indicate the it could be any model with a single saddle seat from the 60+ year old model.